Joint Entrance Examination (JEE) Main 2016 was held successfully on 03 April 2016. It is organized every year for admission to NITs/IIITs/CFTIs. Lakhs of candidates appeared for this test. All the candidates who have appeared for JEE (Main) are informed that the result of paper 1 will be out on 27 April 2016. You can check JEE Main Exam result 2016 from the direct link given here. JEE main ranks/ result had been declared on 23 June 2016. 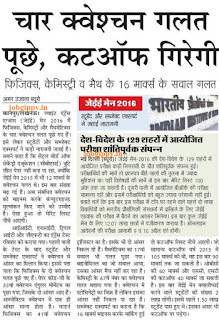 The score of Paper-I of JEE (Main) – 2016 for all candidates had been declared by 27th April 2016. Candidates who had appeared for the test can check their scores after that. This score shall comprise the actual marks obtained in Paper-I of JEE (Main) – 2016 along with the status of those who qualify for appearing in JEE (Advanced) – 2016. The score card of JEE Mains shall have the details of marks obtained in the test. It will also indicate the qualifying status of candidate for JEE Adv. On the basis of score in JEE (Main)-2016 and normalised score in Class 12th or equivalent qualifying exam (60% & 40% weightage respectively), separate rank lists will be prepared for admission to B.E./B. Tech. and B. Arch/ B. Planning (in institutions other than IITs). This will be declared on or before 30th of June 2016. JEE (Main)-2016 Rank Card indicating All India Rank, State Rank and Category Rank with total marks and marks in each paper will be available on JEE (Main) website after the declaration of JEE Mains result. If a candidate furnishes wrong information, their rank/result will not be declared. 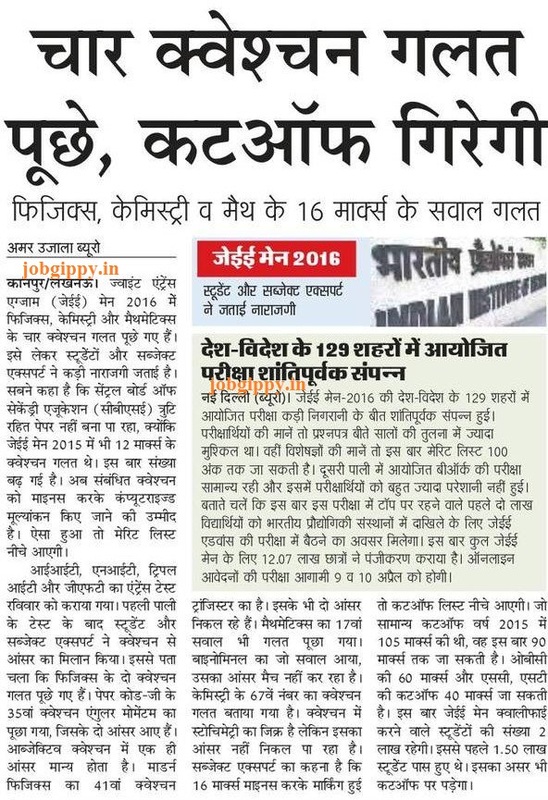 Here are some of the important dates of JEE main exam 2016. No score/rank card will be dispatched to the candidates, They are advised to download their score/rank cards from the JEE (Main) website http://jeemain.nic.in only. JEE (Main) – 2016 have two papers, Paper-1 (B. E. / B. Tech.) and Paper-2 (B. Arch. / B. Planning.). Candidates may take Paper-1 (B. E. / B. Tech. ), or Paper-2 (B. Arch. / B. Planning. ), or both as per the course(s) they are seeking admission to. Candidates can check their JEE Mains result from below given link via jeemain.nic.in. It will be converted to a direct link after the declaration of result.